Professor Salomé Martínez is a Mathematical engineer from the Universidad de Chile and a Ph.D. in Mathematics from the University of Minnesota, United States. 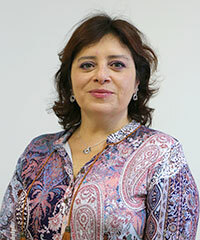 She is a Professor of the Universidad de Chile and an academic of the Department of Mathematical Engineering, researcher at the Center of Mathematical Modeling and director of the Education Lab of that same unit. She was distinguished with the 2011 Academic Excellence Young Investigators Award from the Chilean Academy of Sciences, in recognition of her contribution to the development and education of mathematics and scientific leadership. Her lines of research are partial differential equations, in particular, the study of models that come from mathematical ecology and physics. She has led a line of work around teacher training in mathematics. She has taken part in various committees of the university and the faculty with the purpose of advancing in gender equality. In particular, she led the efforts that resulted in the creation of the Gender and Diversity Department of the FCFM.